Good old-fashioned chimneys are hard to find! Scores, perhaps hundreds, of Chimney Swifts whirl in a flock, then form a funnel-shaped cloud above a chimney. Now they begin to descend, first one - and finally hundreds - swirling down into the chimney. Each bird drops inside and catches onto the rough interior, where it will hang until morning. The number of Chimney Swifts has dropped in recent years, in part because good old-fashioned chimneys are harder to find. Learn what you can do to help at ChimneySwifts.org. Seattle area fans can see Vaux's Swifts at Swift Night Out. Check out the Swift Night Out near you. Just what is it that could bring crowds of people out after sunset on a September evening to stare …. at a chimney? Watch now. Here they come! [voice of a child - Whoa!] Scores—perhaps hundreds—of small black birds whirling by, then forming a funnel-shaped cloud above the chimney. Now they begin to descend, first one, then a few more, then dozens, then hundreds swirling right down into the chimney. Each bird goes in with its wings held high, as if parachuting, dropping inside to catch onto the rough interior, where it will hang until morning. We’ve just witnessed a flock of Chimney Swifts enter their communal roost site for the night. Small, dark, streamlined birds, Chimney Swifts spend much of the year far to the south, in the Amazon basin of Peru. But in the spring, they come north, east of the Rockies, to nest. West of the Rockies, Vaux’s Swifts perform the same nightly ritual. The number of Chimney Swifts has dropped in recent years, in part because good old-fashioned chimneys are harder to find. You can help. Learn how you can alter an existing chimney or provide a roosting tower, to make swifts feel more at home. Begin at our website at BirdNote.org. 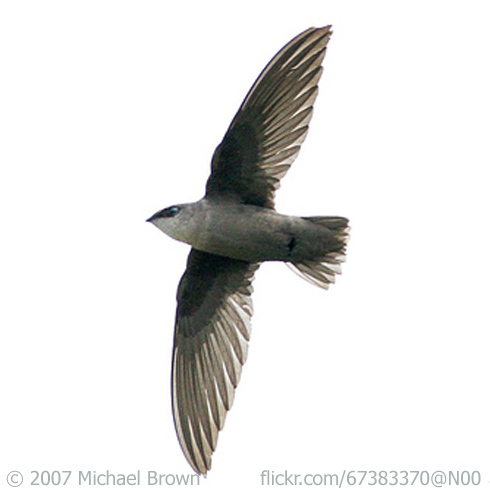 Call of the Chimney Swift provided by The Macaulay Library at the Cornell Lab of Ornithology, Ithaca, New York. Recorded by W.L. Hershberger. Ambient sounds by Kessler Productions. “Spanish Crowd Chatting Sound” from “Immersive Ambiences: Europe Sounds Effects.” Airborne Sound Library: 2007.